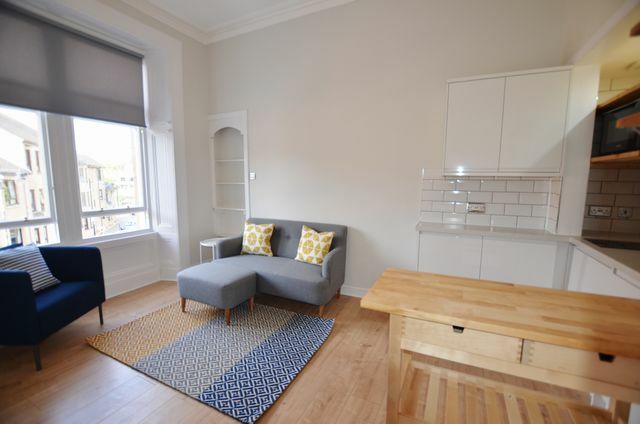 Fully refurbished one bedroom compact flat located at the heart of Bearsden Cross. This stylish flat is located on the first floor of a maintained block and offers comfortable accommodation for a single person or couple.The flat comprises entrance hall, rear facing bedroom with fitted cupboard housing washing machine and boiler, stunning bathroom with shower over bath, storage cupboard and bright front facing living room and kitchen with great open views. Gas Central Heating. The kitchen is compact but houses all the essential - 2 ring induction hob, fridge with freezer compartment, combination microwave/oven/grill and sink area. Fully renovated throughout offering a stylish and comfortable home. I Would like to pass on my sincere thanks to Fineholm for their efficiency in making this tenant's occupancy go so smoothly. I have greatly appreciated the advice and how extremely good they are in their profession.